Jeannette Ng rewrites the missionary tale to create a new type of gothic fairytale. 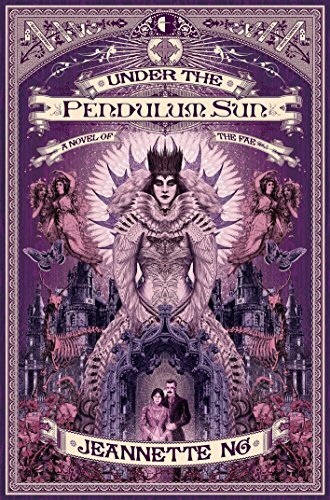 Here at Nerds, all of my book reviews have focused on YA literature, but I’m going to break my streak for a book so in my personal wheelhouse I have to write about it—Under the Pendulum Sun: A Novel of the Fae by Jeannette Ng. Ng’s backflap bio describes her writing as “gothic fantasy with a theological twist.” My original interest in the novel came from the basic plot description: missionaries are sent to convert the Fae in the newly discovered land of Arcadia. I’m sure some of you are thinking—wow, sounds super boring. Meanwhile, I’m flipping out because OF COURSE missionary societies would have sent missionaries to evangelize the Fae. What a perfect plot. Part of my interest stems from a unique childhood that involved reading a lot of missionary biographies. From Jim Elliot’s story of martyrdom as written by his wife Elisabeth Elliot in Shadow of the Almighty to Torches of Joy: A Stone Age Tribe's Encounter With the Gospel about Christian writer Ted Dekker’s parents (and his childhood). And of course, the Christian library my family occasionally visited (we went to plenty of regular libraries, too), carried the entire collection of Christian Heroes: Then & Now by YWAM (at one point in my life, I could have told you without Googling that the letters stood for Youth With a Mission). In fact, I hadn’t realized how much I’d absorbed from those narratives until reading Under the Pendulum Sun. While according to Ng’s bio, she comes to this material from an academic background, damn, did she get it right. The novel starts with Catherine Helstone (a nice nod to Wuthering Heights, one among many) searching for her brother, who has been sent to spread the Word of God to the Fae, but Laon has only sent unsettling and abrupt letters, and even those stopped arriving months ago. When she arrives in Arcadia, Catherine is presented with the bizarre and familiar fitting for any story of the Fae. Ng’s worldbuilding really shines in the descriptions of Arcadia. I’m not an avid reader of fairy stories, though I enjoy them when I do pick one up, but Ng’s world felt fresh, not just a rehash of Andrew Lang. As you might guess from the title, the sun swings in a pendulous arc across Arcadia, but the moon dangles from a fish (imagine a deep sea humpback angler). The descriptions of the Fae rarely repeat and vary from the more traditional gnomes to beings made of sand. In fact, I wanted more. Queen Mab keeps Catherine and Laon corralled in a castle and denies them entry to the interior of Arcadia, so much of the book is spent in the castle with few forays beyond the gates. While a perfect setting for the gothic genre, Ng’s descriptions of Arcadia were so compelling I wish the Helstones had gone beyond the castle. That being said, a castle in Arcadia is no ordinary castle, and Ng hides plenty of surprises throughout the ponderous corridors to keep readers turning pages. While gothic and fairy genres are certainly niche enough, the missionary aspect brought a breath of fresh air to the genres. Ng carefully takes the reader through the traditional tropes of missionary biographies: journals, converts, translating the Bible into the local language, including racist comments that so mimicked the voices I remember from my childhood I found myself underlining and tabbing throughout the book. For example, “Selfishly, I had thought myself abandoned. I spared not a heartbeat for those that languish in the grim empires without word of the Redeemer.” Such a line could have come straight from Elisabeth Elliot’s Shadow of the Almighty. By capturing this proselytizing tone, Jeannette Ng uses the age-old fairy story to remind the reader of one of colonialism’s pillars—religion. Untimely, Ng rewrites the missionary tale, fusing it with fantasy, in a gothic novel where religion fails. *One caveat, which is not a criticism. This novel is very niche. Folks might find the missionary aspect grating, but this unique look into colonialism merits a reading.